Have you ever wondered what it tastes like to kiss the sun? 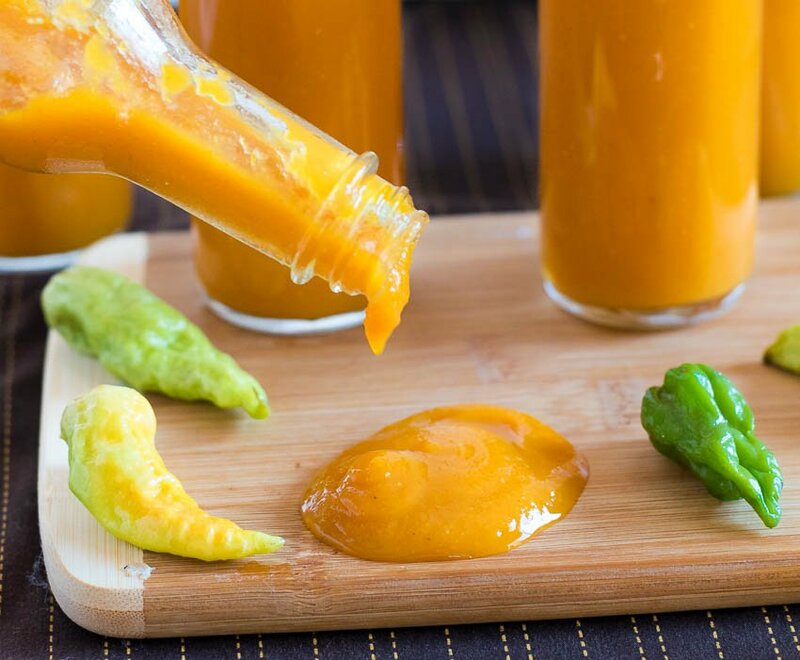 This Roasted Ghost Pepper Sauce is as close as you will get to experiencing that on earth! If anyone doesn’t believe that I am a full-fledged heat junky, this Roasted Ghost Pepper Sauce recipe should put any such concerns to rest. Ghost peppers are commonly recognized as the hottest pepper on earth, which until a couple years ago was true. Recently the Carolina reaper surpassed the ghost pepper as the worlds hottest flame thrower. A few years back I decided eating a whole ghost pepper seemed like a good idea, as having a knack to make bad decisions is a specialty I have painstakingly cultivated over the years. Upon popping the craggy pod into my mouth my I was greeted with a sensation familiar only to someone who snacks of branding irons. However, once I got over the fact that my taste buds were likely melting and my internal body temperature was reaching 212 degrees, I found the pepper to be incredibly flavorful with a distinct fruity flavor. I was hooked. I celebrated my successful consumption of a raw ghost pepper by slowly sipping down a gallon of milk over the course of the next 30 seconds. So yes, this Roasted Ghost Pepper sauce packs a tad bit of heat. However, its deep roasted flavor and fruity undertones makes it the most flavorful hot sauce in my arsenal. I put in on everything from egg sandwiches to Mexican foods, to cereal. OK, maybe not cereal. If you like heat, you will love this sauce. If you don’t like heat, you will probably just leave me angry messages in the comments below after trying this (and I will laugh at you). If a flaming hot sauce of death isn’t really appealing to you, check out my Asian Hot Sauce instead. It a great all purpose sauce for Asian food or pizza, similar in heat to sriracha. You can store this directly in the refrigerator for months, since it contains a high percentage of vinegar. However, it is also shelf stable for 6 months when properly bottled. To bottle it just purchase 5 oz woozy bottles and caps. Sanitize the bottles by heating them in boiling water, wash the caps to ensure they are clean, then fill with the sauce when it is heated to 180+ degrees. Flip the bottles upside down, and let stand inverted for 5 minutes to sanitize the caps. To get woozy bottles, you will likely have to purchase them online. I have yet to find a local source for them around the Fox Valley. If any of you are aware of any such vendors, please let me know if the comments below. Once you have the bottles they can be washed and reused, but you will need to purchase new caps. The above link is an affiliate link. 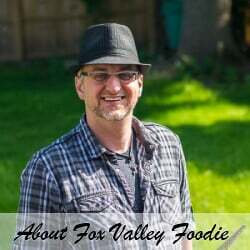 Any Amazon purchases made through this link helps support FoxValleyFoodie.com without any additional cost to you. Cut carrots into 1-2" pieces and roast at 450 degrees for 45 minutes, or until tender. Add onions and peppers about halfway through and cook until tender and slightly charred. Add garlic in the final 5 minutes and roast until softened. Remove all vegetables from the oven and place in a saucepan with 2/3 cup water and enough vinegar to cover. Simmer for 10 minute to ensure everything is fully softened. 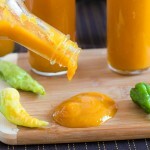 Add entire mixture to blender and puree for a few minutes to ensure smoothness and add remaining vinegar. Return to sauce pan, bring to 180 degrees and bottle. 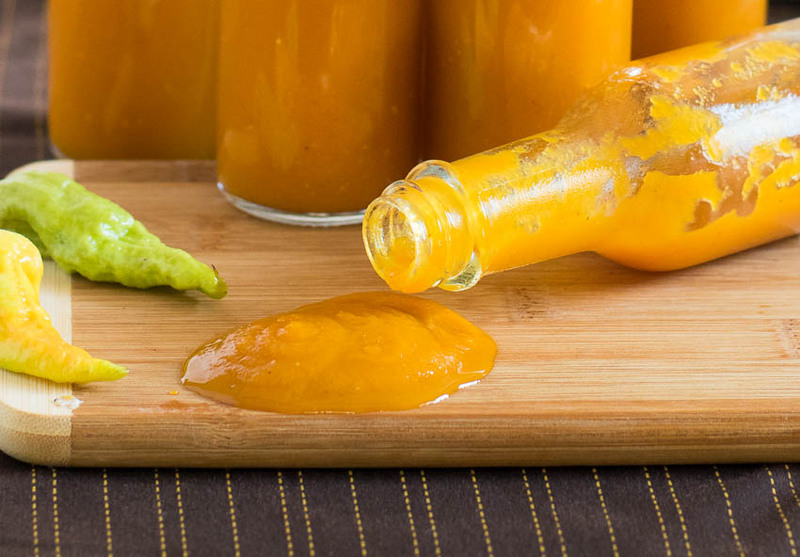 If you are bottling the sauce, do not cut back the amount of vinegar used as that may increase the PH level of the sauce above safe ranges. 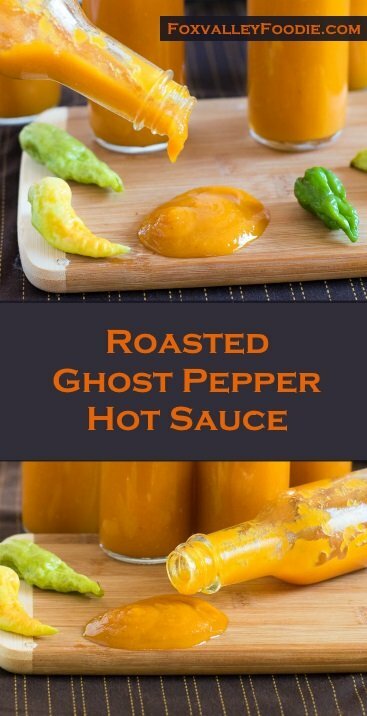 If you enjoyed reading my Roasted Ghost Pepper Sauce recipe then you should probably like me on Facebook and follow me on Pinterest too. That’s what I would do at least, because if you don’t get to know me but you still use my recipe it is kind of like taking candy from a stranger, and your mom taught you not to do that. Don’t disobey your mom, subscribe to Fox Valley Foodie today. My son loves this. He said he “will put it on everything.” He just ate it on corn on the cob. I’m sure the rest of my family will love this too! Thanks for a great recipe. I am working on this right now, but mine is not as thick as your pictures show, what am I doing wrong? You probably aren’t doing anything wrong. Carrot sizes vary, so you are probably using smaller carrots than I did. You can add more carrots for more body, but quite honestly I really like it as a thinner hot sauce too! I bottled mine so added the 2c of Apple cider vinegar, my question is, does it eventually blend in better? The sauce itself came out delicious as the peppers were perfectly ripe and roasted beautifully, but I just get a bit of vinegar aftertaste. Let the flavors meld a bit. Just finished making the sauce. My question is, the other recipe that I previously used called for two tablespoons of raw sugar. This gave the sauce a sweet taste. Nevertheless, my sauce today is delicious. With tons of ghost peppers and a pantry full of ghost pepper salt, sauce, flakes, etc., and with tons out in the garden, I will not plant ghost peppers again. You can certainly add sugar if you desire, I enjoy it as written, but sweetening it up a bit would taste fantastic as well!